It's World Environment Day, and this year's theme is "Think, Eat, Save". Find out how much food goes to waste each year, how many people are still hungry despite that, and what you can do to make a difference to save the environment. Think, Eat, Save and reduce your Foodprint — the theme of this year's World Environment Day sounds simple enough, and its aim is to combat food waste. Food waste is something that isn't even on the radar of many people living in developed economies. Yet, the United Nations Food and Agriculture organization says that a whopping 1.3 billion tons of food go to waste every year. 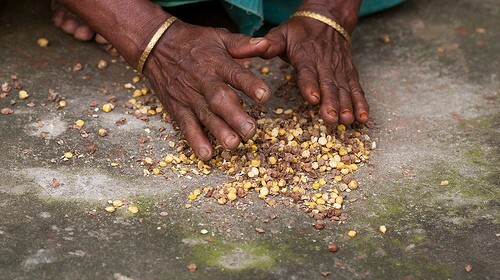 Shockingly, that amount is equivalent to all the food produced in sub-Saharan Africa on an annual basis. One in seven children go to bed with empty stomachs, and more than 20,000 kids under five die from hunger each year. While some people go horrendously short, obesity rates have doubled since 1980 and 500 million adults are obese worldwide. These are painful facts, and apparently we need something like World Environment Day to even bring them to our attention. It is obvious that the Earth is dealing with a problem; a gigantic imbalance in resources, money, and food. You don't need to travel to a Third World country to encounter hunger, but you will need to look beyond developed western nations to find citizens who are dying from a lack of food. Most SteadyHealth readers will fall into the category of Earth dwellers who are relatively privileged, and many of you are lucky enough to be in a position to let food go to waste on occasion. You've have probably been there. You have worked late, and bought a sandwich instead of eating the food in your fridge. You have been unsure if that lettuce was still edible and decided to throw it out. You may have taken your other half out for a meal spontaneously while letting your planned meal go to waste. Or, you may simply have bought more that you can actually eat. If you are guilty of one of these “crimes”, World Environment Day is a fantastic opportunity for you to start making changes within your own household and beyond. Everyone can contribute, and even if you are already a “green” person, you can still do more. So take a moment to Think, Eat, and Save and reduce your “Foodprint”. Think about the people who are malnourished and at risk of dying from hunger, and think about your own attitude toward food. Eat, but responsible foods produced locally in healthy ways. And save — your money, your own health, and the environment. Wasting food isn't something anyone is proud of, but you may be wasting a lot more than that food you are throwing out — you also waste the resources that were spent creating that food and the fuel that was burnt to transport the food to you. The United Nation point out that it takes 1,000 liters of water to produce a single liter of milk, and as much as 16,000 liters to make a hamburger — cows need to eat and drink to produce your food, after all. Water is only the start. Pesticides, fuel, and labor also go into producing the food you may be letting go to waste. Read More: Which Is Cheaper, Junk Food Or Healthy Food? You can start by making a decision to consciously avoid being wasteful with food in your home. Don't buy more than you need, and steer clear of restaurants and fast-food outlets as much as possible. They are, after all, notorious for serving much larger portions that you need. Organization is often the biggest obstacle when it comes to preventing food waste. If you don't practice meal planning in your home already, World Environment Day is great time to start. You could begin by planning your meals for the next week, together with all the members of your household. Sit down with a recipe book or some good websites, and decide what you would like to eat. Calculate how much you need to buy of each individual ingredient too, so that you don't end up with left-overs that you don't use. Those who do make too much food could ensure those meals are freezer-friendly, so that they can save their food for another day rather than letting it go bad and throwing it out, or they can take their left-overs to work or school the next day. Buying local produce is another important step you can take to become greener. Produce that is flown halfway across the globe before it reaches your plate has consumed much more fuel than produce grown by local farmers. Farmers' markets are a wonderful place to shop, and you will probably find your fruit, veg, meat and dairy is much tastier if you obtain it locally too. It's even better if your local produce is organic, so no chemicals are used in the process. Finally, fruits and vegetables use fewer resources than meat and dairy products. The animals that you have to thank for those products needed to eat an awful lot to be able to give you meat, milk, or eggs after all. You don't have to become a vegan, but you'll do the environment a favor if you cut back on your consumption of animal products. Beyond Your Own Family — What Can You Do? It is true that we all need to be the change we want to see in the world, but that doesn't mean we need to stop with ourselves. What are some small but proactive steps you can take to make the world beyond your own doorstep a little less wasteful? You can start with your place of work or study, or your kids' school. If these places have canteens, you could start an initiative to make those canteens less wasteful. Find out if they produce more food than anyone could ever use up, and try to get them to purchase local (if possible organic) products. 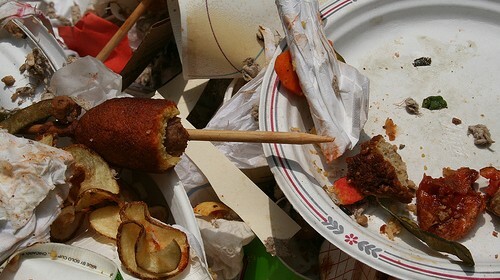 Encourage your town or city to start a curb composting program so food left-overs get reabsorbed by nature, rather than ending up in the city's waste stream where they'd produce methane. Donate your own non-perishable leftovers to homeless shelters, soup kitchens, or women's refuges. Tell your friends all about this year's World Environment Day theme, and ask them to get involved. Facebook is a great way to reach many people very quickly, but talking to someone in person may make a lot more impact. People who would like to get involved in preventing food wastage in the longer-term should consider joining local green groups to spread the message and make a real difference in their communities. Is nite trim weight loss pill the real thing or a scam?